Citizen has launched a new mobile four inch label, receipt and ticket printer. The CMP-40L is a hand-held, hard-wearing and easy to operate printer that is perfect for fast and reliable printing on the move. The compact CMP-40L is designed for ultimate ease of use. Members of staff in any business environment require minimal training in how to operate it and rarely need to change more than just the media rolls – a process which is quick and easy in itself. The most versatile of the CMP series, which also features the CMP-20 and CMP-30 mobile printers, this printer is ideal for a variety of applications, including: labels and delivery notes in logistics; price mark-downs in retail; receipts in restaurants, bars and cafes; on-the-spot tickets for transport use, parking and traffic violations; and for issuing entry passes for people waiting in line. Thanks to Lithium Ion battery technology the CMP-40L can be used for long periods of operation before recharging is required via its easy-to-charge power packs. The Wi-Fi and Bluetooth connectivity enable the efficient CMP-40L to be linked with payment taking devices to be used as a reliable mobile point of sale (mPOS) device, making it ideal for busy retail environments. The printer user can monitor the connectivity level and printer status on a clear LCD Screen; it does not have to be monitored from a stationary desktop computer or laptop, and can easily be accessed from a range of iOS, Android and Windows devices. For anyone using the CMP-40L, they’ll appreciate the simplicity and speed of operations, with capability to print off up to four inches in width and print speed of 80mm per second, 3.1 ips. Attaching labels to boxes and items from a mobile printer is straightforward, stress-free and no longer a sticky business, thanks to the integrated label peeler and tear bar feature. Production is never held up if a change of paper type is necessary, as this can be performed in a matter of seconds. So if switching from a printing task that requires a receipt roll rather than a thermal label printer in a café for example, the user can be handing out a coffee receipt within a minute of labelling up cake and sandwich boxes. 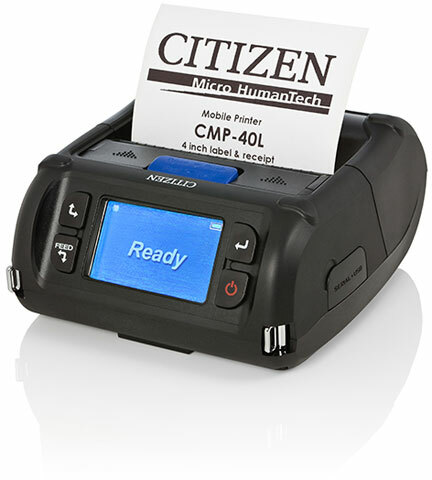 The four-inch CMP-40L completes Citizen’s range of market leading mobile printing solutions, which are also available in a two inch model, the CMP-20, and a three inch version, the CMP-30. In terms of look, feel and durability, the robust CMP-40L is the ultimate replacement for customers that have been using the Citizen PD-24. The printer is protected from the challenging conditions and substances that may cross its path, especially when used in a warehouse or loading bay setting, thanks to the hardwearing plastic polymer casing. With an impressive IP54 ingress protection rating, the durable CMP-40L has been designed to withstand likely dust ingress, while remaining unaffected by water splashing. The printer is also incredibly robust, able to withstand a fall from 1.8 metres without suffering any damage.